Controls Wii Remote: Use the Pointer to move the cursor. Buttons: / Hold to spray-paint. 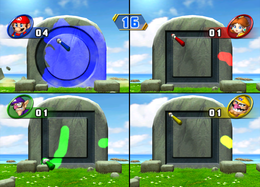 Speedy Graffiti is a 4-Player minigame that is found in Mario Party 8. The first player stares at the ocean. They are surprised when a stone tablet falls down onto the ground, causing them to run off-screen. Pointing the at the screen and using it as a paintbrush, the players must paint the shapes that appear on stone tablets, including circles, squares and triangles. As they trace the shape properly enough, the tablet breaks and another tablet drops down onto the ground. By the end of the 30 second time limit, the player who managed to break the most stone tablets wins the game. Each character runs to the tablet, which crumbles right after. Winners do their respective victory pose while losers sulk. Rules – "Spray-paint the shapes carved into the stones." Advice – "Trace the whole shape. Don't leave any breaks!" This page was last edited on October 6, 2018, at 06:27.